BEACH HOMES & DÉCOR: WHAT’S YOUR STYLE? Today's post is brought to you by Nicole LoCicero who is the Owner/Blogger at BeachDecorShop.com, an online coastal decor store, that since 2003 has featured a variety of products and styles to make your beach house (or landlocked house) a relaxing, personalized place for family and friends to enjoy. The beach life is grand. Everyone knows that and too few get to truly enjoy it. Most people can only manage brief getaways to the shore where they tolerate hotel rooms and gobs of fellow tourists for a few searing hours on the beach. Perhaps there’s a fancy dinner featuring the catch of the day or some fishing conquests sizzling on the grill. Other than some shopping and strolls along the boardwalk, that’s about the closest many will get to the beach life. There are some who do call the beach home or are able to split significant time between the shore and another residence. For those fortunate enough to make this possible have a variety of options when it comes to building styles & decorations. The most common styles for coastal homes in the United States vary and are driven largely by location and taste. The Spanish Revival inspired beach home is predominantly found along the coast of Florida and California. Most notable of this style are soft earth tones, stucco walls, terracotta roof tiles and of course palm trees. Some other characteristics include curves, tile flooring, tower like chimneys, balconies, ornamental ironwork, wooden doors and courtyards and patios. Apart from the terracotta roofs, the most telling feature of this style are arcades, which is an arch (or series of arches) that are supported by columns, and used to shelter walkways or entrances. The interior of these homes can, of course, be decorated in a variety of styles, but you will typically find rich, dark colors. Furniture made of heavy, solid wood, stained to deep mahogany, or cherry colors. Room colors and fabric choices tend to also be rich reds, tans and browns to create warm feeling reminiscent of Spanish sunsets. 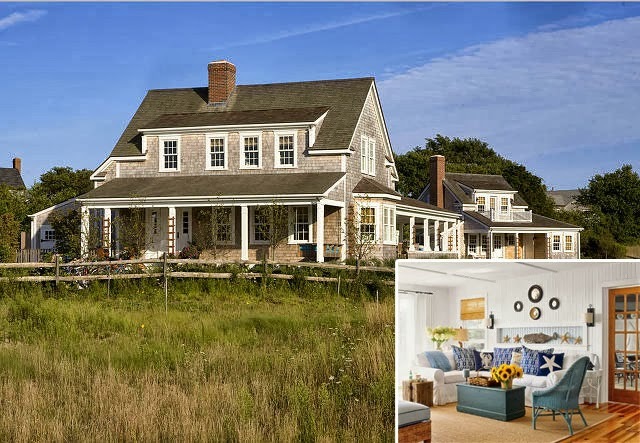 Another popular style of beach home, particularly in the north eastern part of the country, is known as the Cape Cod. These homes are designed to blend into their surroundings and landscape, covered unpainted shingles or clapboarding. After a period of time and exposure to the elements this exterior develops a muted gray color. The decorative centerpiece of the traditional Cape Cod is the front door, which often painted in a contrasting color and bears a welcoming wreath. Windows are typically painted white and bear shutters to protect against strong nor’easter storms. Landscaping is usually kept to a minimum, but the home can have a white picket fence and detached garage. On the interior the most important design element is trim color. Mantels, interior doors and cabinets are painted white and most rooms feature similarly painted wood trim, including crown molding. Typically hard wood floors contrast well against such a clean, modern look. Fabrics and furniture tend to mirror this theme, being light, airy colors such as sea green, light blue, yellow and white. The walls, shelves and other furniture are often complimented with nautical and beach style pillows and décor, that tie the exterior oasis to the indoors. 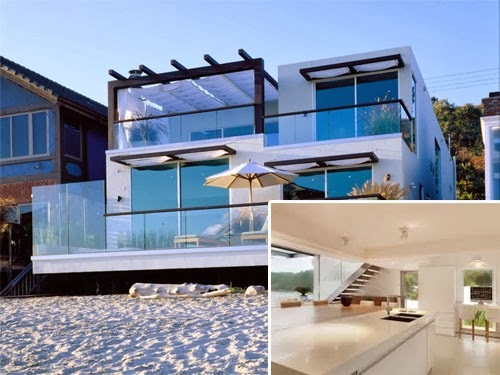 Most often found on the West Coast, the modern style of beach home architecture is easily the most independent. The exterior of these home feature clean, square lines, boxes shapes and large windows. Simple elegance is the name of the game for owners of these homes as most often white walls compliment the simple, yet contrasting lines of dark features like hand rails or trellises. Another glaring feature is the extensive use of glass so as to provide the most expansive, unobstructed ocean views possible. Because of the use of glass, many elements of these homes appear to float. The simple elegance of most modern beach homes continues as you cross the front threshold as you find yourself surrounded by white walls, floors and ceilings. Minimalistic straight lines are seen throughout a large, open living space that seem to simply dissolve into the next. The kitchen is often void small appliances or anything else on the counters. Many modern beach houses defy the laws of gravity using stairs that seem to float in place. The use of glass is often played up as well. Furniture tends to be functional, minimalistic and white save for random explosions of color from various accent pieces strewn throughout. Fabric is not often a focal point of the interiors of modern homes. Between these three extremes of typical beach homes there exist variations of cottages, bungalows and other styles. No matter your tastes, it’s clear that when your dream comes true, your beach home is waiting for you, décor and all. Thanks Nicolle for blogging on sealaura! Which Beach House style is your favorite? I am with you Anita! I love the modern look but I also wouldn't mind a boho beach hut! Even though I left it all behind, I'm still good with beach shack/concrete block waterfront living. I am torn between the shaked and the modern. Beach Shack all the way. I grew up and lived most of my life on the beach by the Santa Monica pier. I have been badly transplanted to the high desert. BUT I am decorating in a beach, boho, style that is close to my heart. MY sweet husband gets me to the beach often. I'm a happy camper.